This Anti Wrinkle Fine Line Reducing Formula can be used in conjunction with Serum W, P & DC. Higher concentration of lipid enhancing ingredients to boost and complement the results of Serum W and give earlier results. Specially formulated to penetrate the skin, delivering natural oils to the innermost layer of the skin where all healing begins. Your skin will be softer & smoother to the touch. Continued use will combat the signs of aging & restore the skin’s natural resiliency & elasticity. Your skin will become visibly healthier & more youthful. 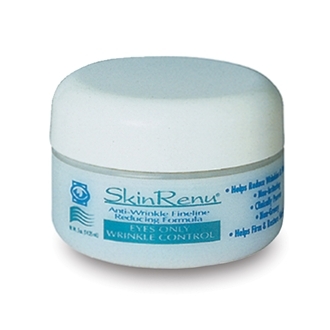 This Anti Wrinkle Fine Line Reducing Formula from SkinRenu can be used in conjunction with Serum W, P & DC. After cleansing, apply to the skin around the eyes. Use morning & evening for best results. May be applied under make-up. Active Ingredients: Dionized water, Isocetyl Stearate, Olive fruit extract, Cholesterol, Cyclomethicone, Dimethiconol, Octyl Cocoate, Phenyl Trimethicone, Ceramide III, Phytosterols, Glycerine, Squalane, Glyceryl Monosterate.